And the Oscar goes to ... Closet Canuck! That's me with Kirk Francis' Oscar. Photo by Leslie Larch. 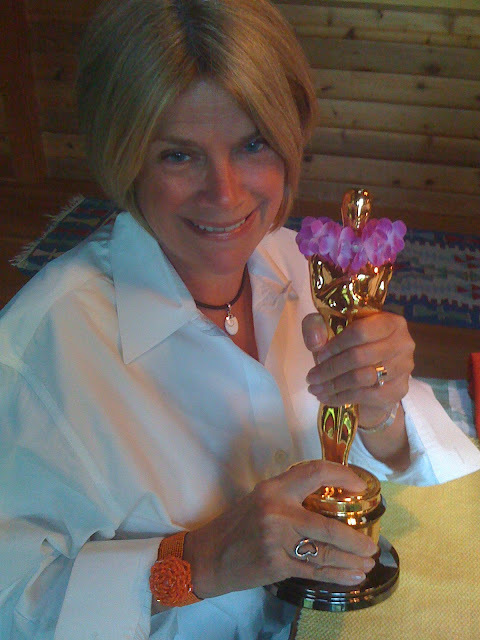 Yup, that's me, Closet Canuck with her Oscar. No, it's not really my Oscar. It belongs to my friend Kirk Francis who won the coveted 8.5 pound statuette for Best Achievement in Sound Mixing for The Bourne Ultimatum (2008). He keeps it in his bathroom. Really. Of course there are Canadian connections with tonight's Oscar broadcast, as I posted here earlier: James Cameron and Jason Reitman among six Canadian Oscar nominees at the Academy Awards. And Canada has its very own Oscar in renowned jazz pianist Oscar Peterson, who died in 2007. And if you want to stay at some famous movie hotels, here is a top ten list from TripAdvisor.